The octopus is a very unique creature from the way it eats to the way it reproduces. The octopus can change its color to match its surroundings in order to both capture prey and escape predators. The octopus has a soft body with eight arms with two rows of suction cups under each one. They breathe by taking in oxygen through their mantle slits, which are behind their eyes. Water goes in through the slit into the mantle then the gills separates the water from the oxygen. The slits then close and the water goes out through tubes called "siphon." The octopus tightens its mantle in order to squeeze a blast of water out of this passageway. The siphon is used for jet propulsion, which is faster than the octopus's other forms of transportation via swimming or walking along the sea floor with their arms. The octopus's skin has specialized cells capable of changing color, opacity, and reflectiveness. Color change can occur rapidly, and is used for camouflage as well as for communication with other octopuses. The animals are also equipped with an ink spray, which is used to cloud the water, blinding predators and dulling smell. Some are venomous, while others are capable of detaching their limbs when attacked. Still others take particular advantage of their lack of any skeletal structure and morph their apparent body shape in order to mimic fish, rocks, or plants. When the female is ready to mate she will release a chemical attractant that flows through the current in order to signal male octopuses from all over the ocean. The female may attract more than one male to her, in which case they will fight to see which will get the opportunity to mate. The chemical attractant also prevents larger males from eating the smaller females. Once the female accepts her mate, the male will release his sperm in packets called spermatophores. The male doesn't have any sucker on the tip of its third right arm, and this arm is instead used to pass spermatophores to the female. When they are done mating the male leaves and the female goes off to find a den to lay her eggs (although the spermatophores can actually be stored within the female for weeks until her eggs are mature). She then finds rocks to close the entrance to the den, and once it is almost all the way covered she squeezes inside the den and then shuts in off completely. Then she goes to the top of the den to lay her eggs one at a time, and while she is laying her eggs she fertilizes them one at a time. She sticks the eggs to the ceiling of the den by using her saliva and some of her small suckers. After the eggs hatch the mom moves the rocks so that the babies can get out. The mother then crawls out of the den and dies. Octopuses have dens that they use for protection from predators and for brooding chambers. To eat they hunt at night and bring their catch back to their den to eat. Their diets typically consist of crustaceans and mollusks, but they often prefer shrimp and crab. Migration from shallow to deep water often takes place when they are about one year of age, although much variability exists between species. 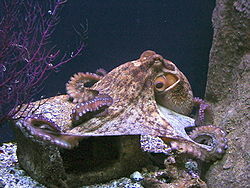 Octopuses are considered to be highly intelligent animals, despite being a delicacy in many societies around the world. They have been known to do such things as open jars and navigate mazes. They will also take advantage of human lobster traps and steal fishermen's catches. Octopus in camouflage at Pirates Cove, Mahé, Seychelles. This octopus is almost indistinguishable from the coral around it - its skin is raised in lumps (it can do this almost instantly) and the colours pulsing over its body match the coral perfectly. Amazing! An octopus's key mechanism of defense is camouflage. An octopus usually has 3 colors in its skin cells (some can have up to four) to change its color. 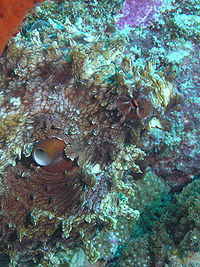 The camouflage of an octopus is very essential in not only concealing from predators, but for warning others of danger. An octopus relies upon its skin cells, which can not only change color but texture to match up with seaweed or coral etc. Octopuses have several secondary defenses (defenses they use once they have been seen by a predator). The second way the octopus defend itself is by its ink sack, which it releases as a cloud (this ink is melanin). This ink is simply useful in decoding smell to the predator, which then helps the octopus get away quickly and safely. Some octopus, for example the Mimic Octopus, can mimic other animals and change its color and texture closer to theirs (animals like lionfish, sea snakes, and eels). Octopus at Sea Life Helsinki, Finland. Giant Octopuses: Natural history & Ecology by David Scheel. Alaska Pacific University. This page was last modified on 24 July 2014, at 16:52.